Discover the foods that stop arthritis pain! Order your copy of Arthritis: A Guide to Diagnosis and Treatment today and you can discover for yourself just how quick, easy and delicious it can be to make a long-lasting difference in your good health. If you have pain, stiffness, warmth, swelling or redness of a joint, you may have arthritis. And you most certainly are not alone. Arthritis is the most common cause of disability in the U.S. today, affecting more than 54 million Americans–of which, 43% have been forced to limit their daily lives. Already, it’s costing U.S. taxpayers over $128 billion a year. And this epidemic is only expected to grow. Estimates show that by 2040, there will be 78 million sufferers (adult and children)–that’s 26% of the U.S. population! Fortunately, there is relief in sight! The editors of University Health News have just prepared a new research-based report, Arthritis: A Guide to Diagnosis and Treatment, that can give you a better understanding of your condition … how it may affect you (or a loved one) … and your treatment options. And it can help you lead a healthier, more active and pain-free life. This valuable report is yours to read with our 30-day risk-free guarantee. Arthritis: A Guide to Diagnosis and Treatment is your guide to leading a productive, fulfilling life with arthritis. It’s about how smart daily choices can give you years of freedom from chronic pain … surgery … loss of function … and perhaps, most importantly, help you keep your independence! Despite what you’ve probably heard, arthritis is not any one specific disease. Rather, it’s a condition referring to joint inflammation, whose varied symptoms fall into the wider category of “rheumatic diseases.” There are over 100 different types of arthritis, each with its own set of symptoms, and specific treatments. Take your first step to conquer arthritis! The human body is an altogether awesome machine with lots of moving parts to maintain. Did you know that we have 206 bones, more than 130 joints and 640 muscles that must work together to allow us to perform our normal range of movements and everyday tasks? In Arthritis: A Guide to Diagnosis and Treatment, you’ll gain greater insight into how your body works … why you have pain … and how relief is right in your hands. From the very first page, you’ll find exactly the guidance you need to navigate the world of arthritis. You’ll learn from the experts how to make better, healthier decisions … reduce, even reverse your symptoms … and help regain your independence. In short, you’ll vastly improve the quality of your everyday life. • The important differences between osteoarthritis (OA) and rheumatoid arthritis (RA). Women have a 300% higher risk for developing the one listed on page 12. • What’s the best test for you? Page 11 helps you decide if you need an X-ray, MRI, ultrasound or a CAT scan. • Your blood work is normal, what does that mean? And, what do you do next? See page 10. • Is your pain caused by gout? On page 27, find an easy-to-follow diet that can end painful flare-ups for good. • Could hip replacement surgery cause arthritis? Get the startling facts on page 30. • Discover the breakthroughs in genetic screening that may lead to “custom” treatments. Page 13 reveals how soon these therapies may be here. Discover the best and safest pain relief! The pain of arthritis may be sudden and brief … or drag on for months or more. Either way, it couldn’t be any more distressing or disrupting to your daily life. That’s why Arthritis: A Guide to Diagnosis and Treatment dedicates three entire chapters to the pros and cons of both traditional and alternative forms of pain management. You’ll discover why, in addition to your physical pain, you may suffer from the tingling, burning of neuropathic pain … depression … anxiety … and problems sleeping–and how to cope. With clear, encouraging, and instructive guidance from the University Health News experts, you’ll be introduced to a growing number of safe, effective treatment options to help you. From oral and topical analgesics and local injections … to biologicals and stem cell therapy … to arthroscopy and arthroplasty (joint replacement) … to physical, occupational and cognitive behavioral therapy, meditation, exercise, diet, supplements, magnets and more. Arthritis: A Guide to Diagnosis and Treatment covers it all! Plus, it’s packed with detailed illustrations, photos, tables and charts that make it all so easy to understand … and so very easy to see exactly what’s happening to your joints and how you can get much-needed relief. • How to limit the side effects of NSAIDs with a lidocaine patch you can wear 12 hours a day. • A promising new treatment for OA that’s still in the research stage. • Thinking of surgery? 15 crucial questions you need to ask your doctor. Find the list on page 43. • Doctor-recommended exercises for the hands, hips and knees. Turn to page 51. • Why orthotics might be just what you need to get up and get on the go. Check out page 54. Then … say “Cheers!” to the anti-inflammation diet! DO eat fish two or more times a week. According to a 2017 study in Arthritis Care & Research, it can lower RA activity. DON’T eat the nightshades. Eating potatoes, eggplant, tomatoes and green peppers often causes a flare-up. DO enjoy one glass of wine or beer each day to prevent RA. DON’T drink alcohol if you take pain-relieving drugs … or suffer from gout. DO increase your intake of fresh vegetables, fruits and healthy proteins. DON’T eat processed foods. Avoid refined sugar, dairy and red meat. 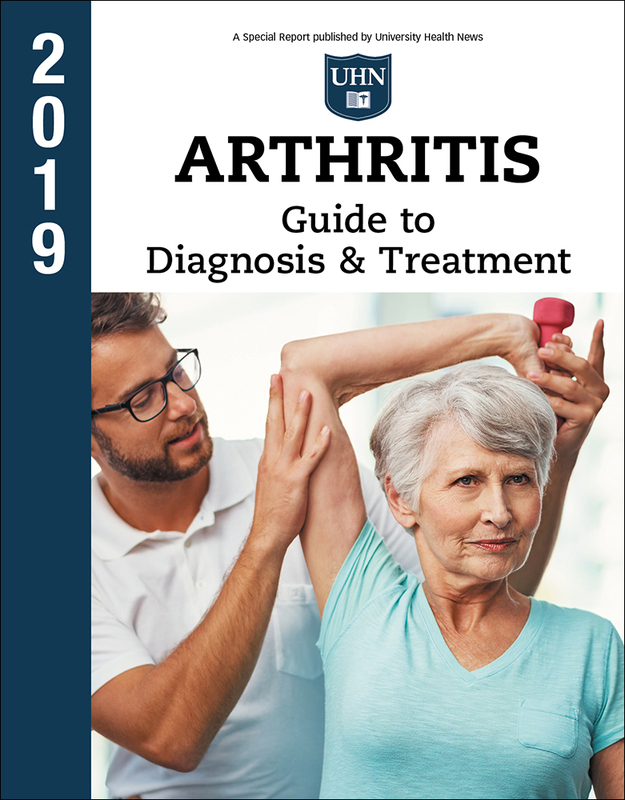 Arthritis: A Guide to Diagnosis and Treatment gives you the tools you need to take a commonsense approach to healthy eating that can reduce your risk of arthritis … and relieve your pain significantly. No wonder the American College of Rheumatology recommends that arthritis patients participate in four types of exercise: Flexibility, strengthening, aerobic and body awareness. You’ll find some excellent options on page 53. Let the mind-body techniques in this report help you get relief from the often vicious circle that is arthritis. You know how it works all too well: Chronic pain causes stress, feelings of hopelessness, anxiety, depression and sleep disturbance … which increase pain perception and inflammation … which only make your pain worse. That’s where mind/body techniques come to the rescue–whether used in addition to traditional treatments or alone. Arthritis: A Guide to Diagnosis and Treatment gives you the facts on meditation, massage, biofeedback, Reiki and other relaxation techniques. You’ll learn about TENS for pain relief, and how it rates with the American Academy of Neurology. And, whether or not electromagnets are safe. You’ll learn how to reduce the risks of supplements with the tips on page 59. Glucosamine/chondroitin, you’ve heard the hype. Now, find out if it’s true … along with all those fish oil claims. Which herbs really help and what’s the right dose? Are you taking the right vitamins? You’ll find the expert answers to all this and more in Arthritis: A Guide to Diagnosis and Treatment. Discover how to take charge and take care of yourself! Better yet, Arthritis: A Guide to Diagnosis and Treatment is available to you at the lowest price you’ll find anywhere. The cost is a very small price for the expert information that can make such a large difference in your life. Order today and if the report doesn’t match your expectations, let us know and we’ll fully refund your money, no questions asked. So, what are you waiting for! Send for your risk-free copy of Arthritis: A Guide to Diagnosis and Treatment today and start easing your pain … and get the life you love back again!